The Peerless, Prominent, Progressive Psycho-Therapeutic and Philosophical Journal / Devoted to the Science of Healing by the Latest Up-To-Date Discovered Methods. Ponca City, Oklahoma Territory (OK). Editor: Peter Pearson. 1/1, January 1900. 50 cents a year, 75 cents abroad; 8 -16 pp. This was a journal published in Oklahoma Territory by an idiosyncratic inventor named Peter Pearson It combined spiritualism, magnetic healing, and crank science into a universal, musical Theory of Everything in which the "object of the universe was to RAISE THE SOUL-ENTITY FROM THE FIRST PROTO-PLASMIC CELL TO THE ELOHIMIAN STATE, which is typified by the biblical scheme of salvation unto life immortal." The journal and Pearson's later book Phycho-Harmonial Philosophy describe the harmonious progression of the soul-entity as a vast scheme of vibratory energy rising spirally, chord to chord, octave to octave, until "in a future state, when all knowledge and wisdom obtainable in this solar system has been acquired, giving the advanced soul-entity a merited entrance in the realm of the Gods, where opportunity is given for the construction of new solar systems in interstellar space from ethereal substance already existing there, waiting to be manipulated upon by advanced soul-entities with adequate knowledge of cosmic harmony forming themselves into groups or electro-magnetic batteries for the generation of power necessary for such gigantic operation." Man could, in other terms, harmoniously develop his inherent Forces and progress through the octaves of possibilities of the human state and then through the "spirit spheres" surrounding each planet and the "Zones of the Arch-Angels" surrounding the solar system as a whole, until he became the god of his own universe. Fifty years after A.J. Davis had begun publishing his harmonial philosophy, Pearson took Davis seriously and proceeded in the true fashion of a crank enthusiast to correct the Master and ring out the changes on his ideas. Pearson was also a spiritualist, with an elaborate theory of spirit communication as the manipulation of magnetic force (like that of a horseshoe magnet) between the octaves of human and post-mortem existence. By the late 1890s he began to advertise himself as a "Magnetician and Healer." A quarter of each issue of the journal was devoted to his own advertisements and testimonials for his services in "Magnetic Healing – so called": "No Drugs but Vital Forces; No Poison but Life Itself," offering free diagnosis in person or by mail, and treatment "from the standpoint of Physiomentalism by Divine Power in Psychic, Vital Magnetic and Electric Forces." Diagnoses, either in person or by mail, were free; treatments were to be negotiated, and Pearson also advertised "magnetic paper" that would help the afflicted. 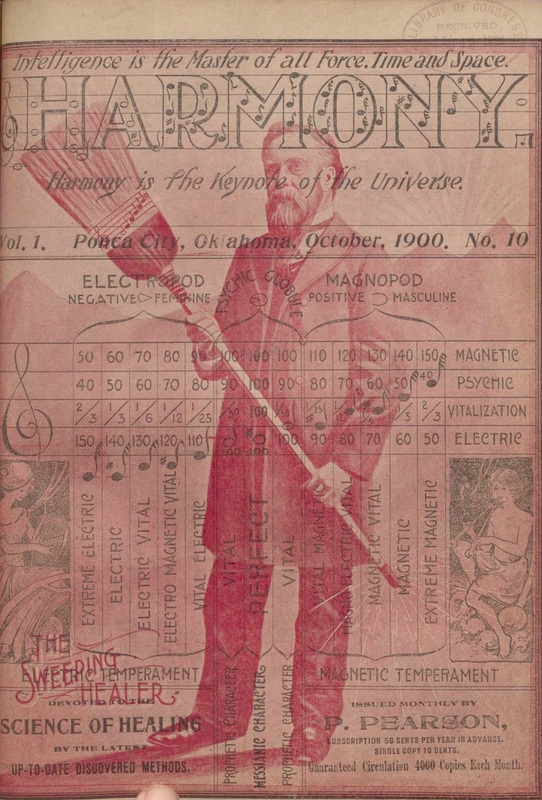 Each issued featured a full-page photograph of Pearson holding a broom adorned with a musical scale and showing rays (presumably magnetic) emanating from top and bottom, though the purpose of the broom was unexplained. The journal announced Pearson's intention to start a School of Psychology to instruct "students in the mysteries of life, occult forces, Psychic Phenomena, the Invisible Forces in Nature, and How to Control Them, that you may enjoy Health, Happiness and Prosperity," but there is no evidence that the school materialized. Pearson gives no hint of the origins of his ideas, other than A.J. Davis, but displays a fair reading of contemporaries like Florence Huntley, C.W. Leadbeater, E.D. Babbitt, et al. In addition to Pearson's contributions, the journal carried regularly an Astrological Department run by Dr. C.S. Tisdale, a healer and friend of Pearson's from Joplin, Missouri, correspondence from those interested in Pearson's cosmology, and a variety of advertisements for little-known Midwestern mediums and healers who would otherwise have escaped our notice: Mrs. Ray Linder, "Clairvoyant Medium," Wichita, Kansas, who offered "reading by mail" for $1.00; Prof. G.W. Grammer, of Colorado Springs ("I will send you full instructions free of charge, how to start yourself on the sure royal road to the most wonderful of all earthly attainments"); Dr. Carlos Wright, Professor of Solar Biology, La Grange, OR (Character Reading for $1.25); Mrs. H.A. Nash, Magnetic Healer (and graduate of the Weltmer School of Magnetic Healing, Arkansas City, Kansas (absent treatment, $1.00 a month, "same as Weltmer and others charge $5.00 for); Dr. J. Bean, Magnetic Healer, Arkansas City, Kansas ("No Medicine – No Surgery"), etc.